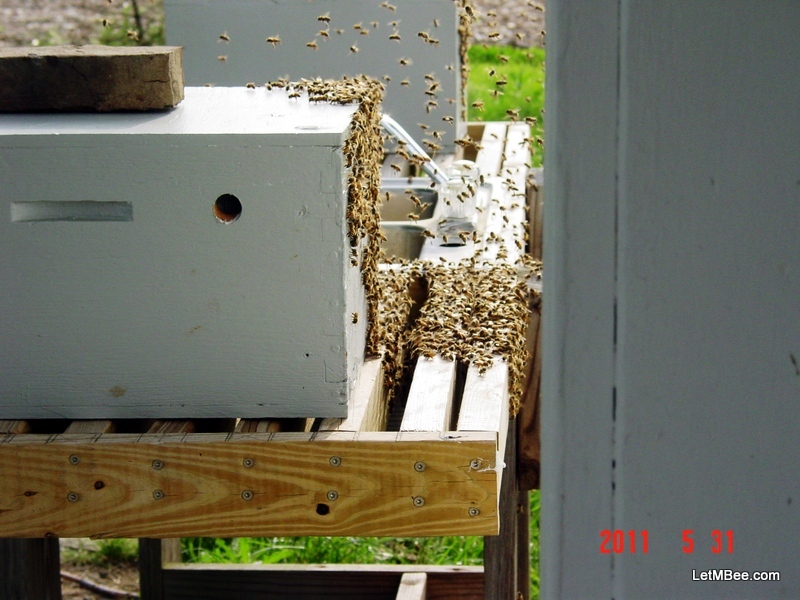 This trap picked up a swarm on 5/31/2011 waiting to be deployed. Note that there is another trap in the background. I am becoming more and more convinced about another observation in swarm trapping. Last year (2011) I began the spring with only three hives. They were all relocated to Hive Site 01 (HS01). I had just began trapping and did almost all of the hiving of trapped swarms here at my home (HS02), so I never had a really large strong colony here for very long. Once a hive was determined to be queen-right I would relocate it to its permanent home. There always seemed to be at least two or three loaded traps around waiting for deployment. Consequently in 2011 four swarms of bees were trapped right here in traps that were just laying around. A couple of days later 6/3/2011 this trap picked up a swarm. It was 4 feet away from the trap in the other picture. I was expecting similar results this year but have been noticing something a little different. In 2011 HS02, HS04, and HS05 had no established colonies. All of these places were spots where bees were caught 2011. This year all three sites have two or three very strong colonies. The traps closest to those sites have not had a hit yet. In fact there was a day two weeks ago that a swarm flew right over HS02. My wife and daughter were out in the garden. The swarm flew all around them. Though there were five or six traps around here they flew over the house and headed North. My wife lost them when they reached a small woods. HS01 had three established colonies in 2011. There was a trap at that site that never got occupied. The same goes for 2012 at HS01. I am certain there are feral bees in the area. I grew up at that site and almost every summer a swarm of bees would descend on one of the brick pillars on the front of the house. When I was a kid I knew of no beekeepers int he area. For a while I thought perhaps since the colonies living around Hive Sites 02, 04, and 05 swarmed last year maybe they were taking a year off. I don’t believe this to be the case, because I am catching bees at other trap sites where I either had swarm calls or successful trappings in 2011. I am leaning more towards the idea bees take the existence of strong established colonies into consideration when deciding on a location to call home. I have read a lot of forum threads and seen several YouTube videos where people are placing their traps within their apiary. They do this, fail to catch any swarms and decide that swarm trapping doesn’t work. I have no idea how far away is the most optimum distance. I did catch a swarm a little over 1/4 of a mile from HS02 a couple of weeks ago. So if you have your trap(s) hanging in your apiary, get them somewhere a little farther away. I believe it will make them more productive… If you haven’t caught one yet don’t give up. There is still time to pick up a swarm and have it overwinter. What do you think? Have you observed something similar or am I out in left field? 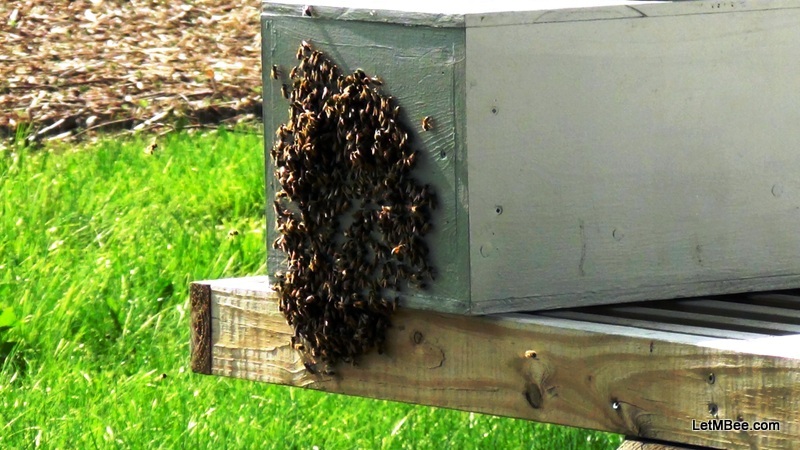 This entry was posted in HowTo, Posts, Swarm Trapping and tagged bait hive, bee, beekeeping, feral bees, feral hives, Indiana beekepeing, Jason Bruns, Swarm, swarm trap, swarm trapping, swarming behavior. Bookmark the permalink. This sounds like a sound observation, sample size are bit small for a real study though. I believe you are correct, it makes sense from a biological standing, all animals (that I can think of) have at some time in their life span the imperative to move away from their home to some degree, this facilitates the survival of a species by spreading out so food and other resources are better managed. I think that a lot of folks see feral bees as dead simply because they have never seen a wild colony, they are not easy to spot and nowhere near as dense as a beekeepers apiary, not even close. Indeed the sample size is small. I know a beekeeper that had a swarm settle into a hive that died out over the winter at his place. He only had three other hives and I don’t know what their condition was at the time the swarm settled in. It is just one of those things that I am seeing as I pick up swarms. The closest I have seen two bee trees together is about 1/4 mile. That is south of me where I keep getting SHB in my traps. There are A LOT of bee trees down there. I have found 4 within about four miles of one another. Two from landowners and two by stumbling around the properties looking for good places to hanging swarm traps. Since having bees, I hear that one particular tone that tells me a honeybee is flying near and all at once I see the tell-tale propolis stain around a hole in a tree. Interesting… I know a commercial beekeeper who leaves empty supers out in his bee yard to catch swarms. He says they catch more swarms in the yard than the swarm traps in trees. There is plenty of forage where he keeps his hives so that may have something to do with it too. Heh… I knew when I was writing that post that at least one person would reply with…. “I have different findings…” 🙂 Bees are going to do what they are going to do and sometimes they will do the exact opposite of what you think. Sam had a good point in that my sample size IS small. I was just reviewing my records earlier this week and made that observation. I have read a lot of people’s accounts of swarm trapping not working. Perhaps my little observational study will have more power after another 5 or 10 years. I still have traps hanging near places where I have hives. You could be right. I was just relaying something I had been told by someone else whose yard I have been to. It could also be too that bees may have different swarming behavior in different environments. A farm with plenty of different fruit blossoms around all summer long is probably a place bees want to stay. Hmmm…after I visited your site last, I went and reapplied LGO in my swarm lure. Still no takers even though I keep reading about swarm calls around me. That makes sense. But unfortunately, I don’t really have another place to put my swarm lure. I’m surrounded by houses. There used to be a house that had bees streaming in and out of the attic. We had thought to put a swarm lure there, but when we checked earlier in the year, the bees were gone. We’ve always suspected out first swarm came from this lady’s attic, and we wished we had gotten more from this hive. With bees you just never know. I bet if you put out a trap or two you will find a place to supply you with reliable bees. Don’t get frustrated, you will find some places to hang traps. Start out with places you might find from swarm calls. If you take the time to talk to the property owner you might just gain a productive trapping site. Just tell them you can put a trap up and they won’t need to worry about bees hanging on their roses. They get interested. Even if you cannot hang one at their place one of their friends might be interested.